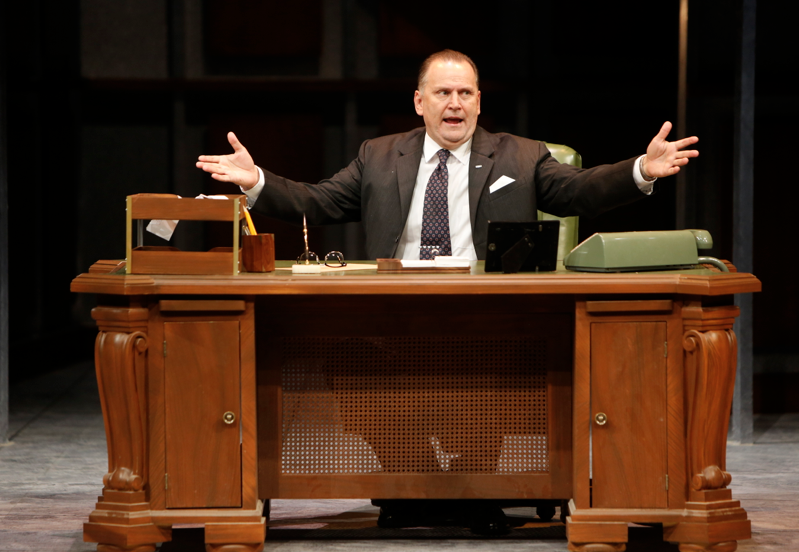 Brian Dykstra as LBJ in the Rep production of “All The Way.” Photo: Jerry Naunheim, Jr.
“All The Way With LBJ” was the battle cry that carried Lyndon Baines Johnson to his elected presidency after his embittered “forced” term after the death of John F. Kennedy. 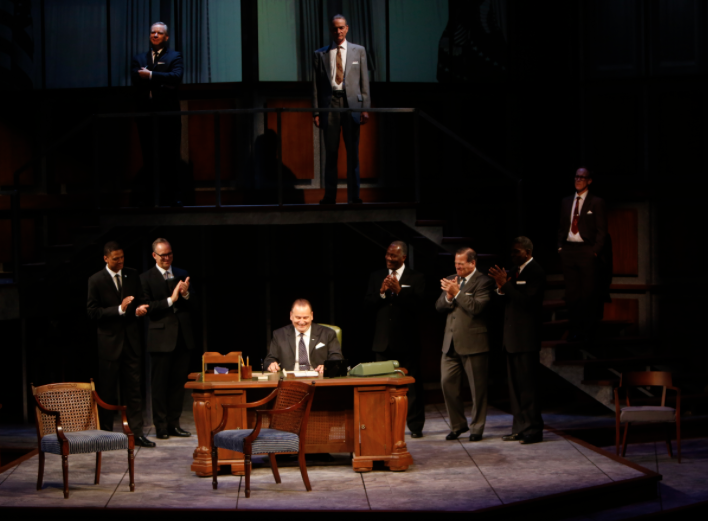 Playwright Robert Schenkkan delivers a taut, mostly factual account of the stormy ride to Civil Rights legislation that became a hallmark of the former VP suddenly turned president and his baptism of fire. Using the first part of LBJ’s famous campaign slogan may bring to mind another kind of play as I noted when I casually told a grocery clerk who asked what I was doing that evening. “Going to see a play at the Rep called ‘All The Way,'” I replied. “Is that some kind of a racy story?” she asked. “More of a story about race,” I told her. 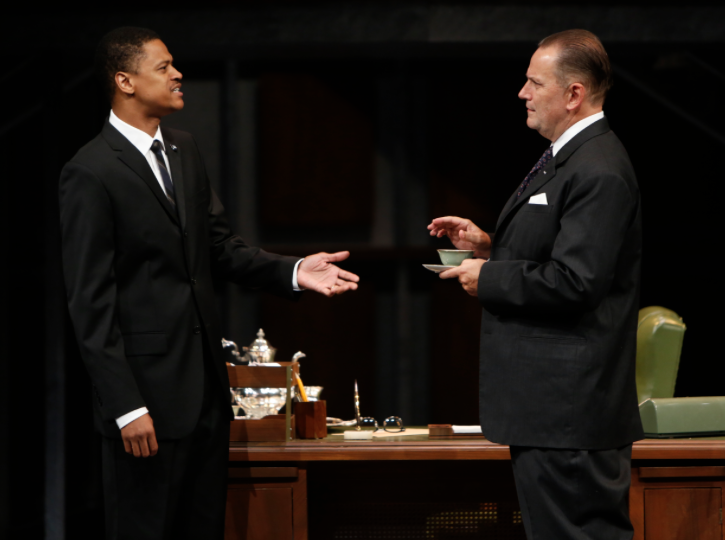 Avery Glymph as Martin Luther King and Brian Dykstra as LBJ in “All The Way” at the Repertory Theatre of St. Louis. Photo: Jerry Naunheim, Jr.
Having lived through the actual events, I remembered certain moments as they unfolded on stage. However, I was in high school at the time and was probably more interested in the completion of the Arch- which was going on at the same time as the upheaval in the country. Funny thing is, the Arch is still going strong and, unfortunately, so are the battles for Civil Rights in the country. Fifty years and not a lot has changed. This provocative tale, however, gives us a swift kick of reality about what was achieved and how quickly the major thrust of the Civil Rights Act has eroded into another generation of division and hate. LBJ surrounded by his supporters as he signs the Civil Rights Act into legislation during the Rep’s production of “All The Way.” Photo: Jerry Naunheim, Jr.
We are introduced to all of the major players after the death of Kennedy as Lyndon Johnson assumes the presidency. Brian Dykstra, like most of the cast of the play, has a similar build to the real person he is portraying but his mannerisms and voice convey the true man rather than sharing the facial features of the distinctive look of the man who was hated by many in both houses of Congress but, unlike today, had the bluster and the threats to make things go his way. Kurt Zischke also shares a similarity to the man who would become LBJ’s running mate in 1964, Hubert Humphrey. Michael James Reed also is powerful as his right-hand man, Walter Jenkins. 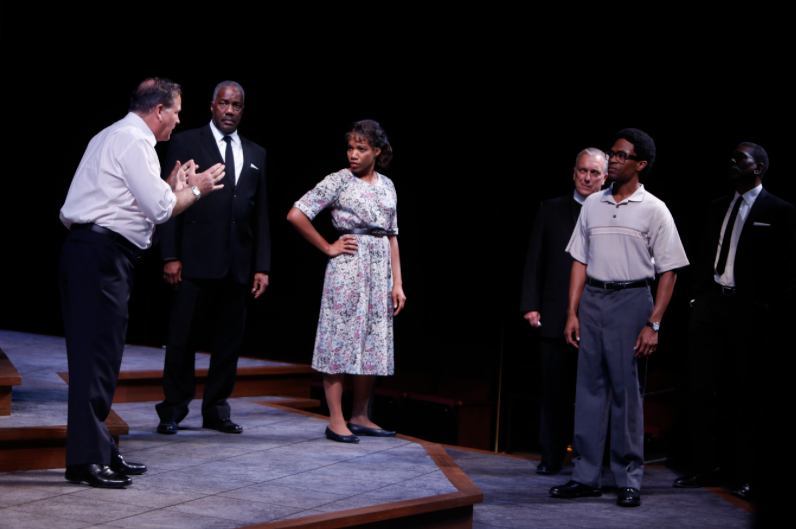 LBJ talks to Fannie Lou Hamer (Myxolydia Tyler) during a tense moment in “All The Way” at the Rep. Photo: Jerry Naunheim, Jr.
Avery Glymph is a charismatic Martin Luther King and Ron Himes shines as the Reverend Ralph Abernathy. A lot of local and Rep favorites fill the stage as 19 actors portray a multitude of figures of the time. Jerry Vogel, Anderson Matthews, Gary Wayne Barker, J. Samuel Davis, Alan Knoll and others lead the way in both major and minor roles. The ladies are strong in this production as well including Bernadette Quigley as Lady Bird and others, Elizabeth Meadows Rousse playing multiple roles including Muriel Humphrey and Myxolydia Tyler as both Coretta Scott King and Fannie Lou Hamer who had a major influence on turning around the impetus for Civil Rights legislation. 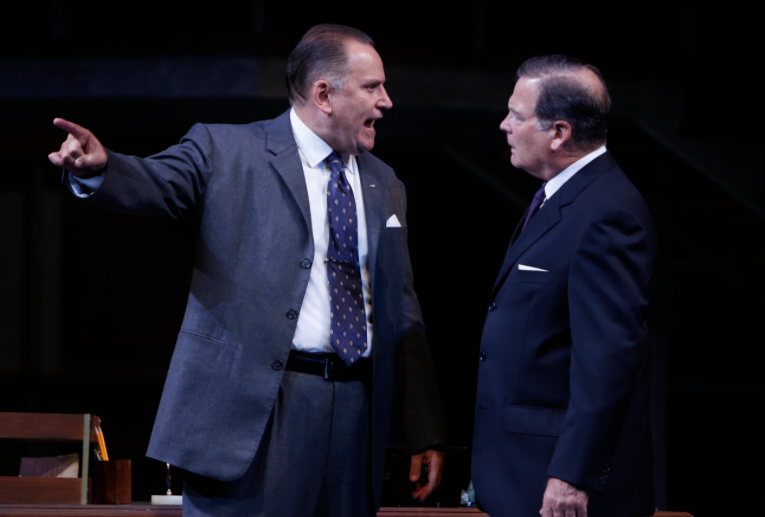 Brian Dykstra as LBJ emphasizes a point to Kurt Zischke as Hubert Humphrey in the Rep’s “All The Way.” Photo: Jerry Naunheim, Jr.
Knowing what we know today, Robert Vincent Smith gives a sly portrayal of J. Edgar Hoover and John Leonard Thompson is a bold Robert McNamara, among others. Rounding out the cast are excellent performances from Richard Prioleau, Stephen D’Ambrose, John Shaver and J. Cameron Barnett. Rep Artistic Director, Steven Woolf, has directed “All The Way” with a strong sense of the wheeling and dealing that goes on to make the country run and the “dog with a bone” mentality of LBJ. Woolf weaves a tale that unfolds on stage like living history. Although the dramatization of the events don’t include a lot of the actual events that took place, Woolf assured me after the play that, even with the salty language we hear in “All The Way,” the real president didn’t hold back. He was a profane and blunt personality who didn’t mind the cajoles and threats that were necessary to do what was right for the country at the time. 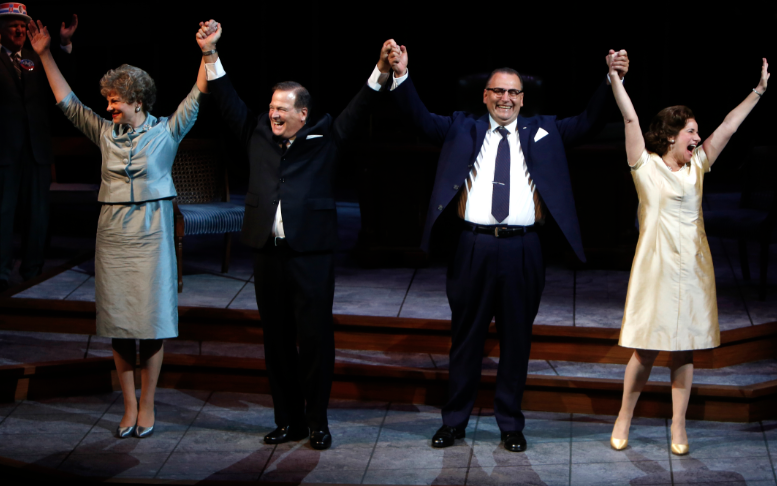 The Humphrey’s and the Johnson’s celebrate their victory in the 1964 presidential race in “All The Way” at the Rep. Photo: Jerry Naunheim, Jr. The design team once again shines at this Rep opening. The James Kronzer set design is stunning in its simplicity and effectiveness. Video panels hanging above the backstage give us the necessary feel of where we are at the time as well as providing that newsreel feel when speeches and news stories are presented. Dorothy Marshall Englis’ costumes are right on the mark and Rob Denton’s lights provide the proper mood. The presidential desk becomes the focal point of most of the action, even when it’s relegated to an upstage, out of the way, mode. No Oval Office rug or other fluff, just desk, chairs and the odd prop to convey what we’re all familiar with. It’s always amazing to recall history that you’ve lived through. Those “oh, yeah, I remember that” moments to the realization that what you’ve lived through is profound and, at times, exasperating. From the simplest of incidents like LBJ’s famous pulling his dogs up by their ears to the work surrounding the most significant of his legislation, “All The Way” is a reminder of what got us here. This moving and significant work will be playing at the Repertory Theatre of St. Louis Mainstage through October 4th. Give them a call at 314-968-4925 for tickets or more information. This entry was posted on September 14, 2015 at 9:43 pm09 and is filed under Uncategorized. You can follow any responses to this entry through the RSS 2.0 feed. You can leave a response, or trackback from your own site.